We were driving back from Adelaide, after a week of erratic eating. Bad take-aways, a couple of pricey restaurant meals, cake for lunch three days in a row courtesy of our client, Balfours. And a very creditable egg and bacon sandwich in Keith. But not a lot of vegetables. Thus, when we went hunting for somewhere to eat in Portland, we thought of Chinese food. Crunchy greens, we thought. A nice hot-pot with mixed vegetables. Bok choy, mushrooms, snow peas. The nice lady at the Melaleuca Motel helpfully consulted Google. She hadn’t personally been to either of the two Chinese restaurants that popped up, she told us, having only been in Portland for a few months. In fact, she didn’t even know there were Chinese restaurants in town. 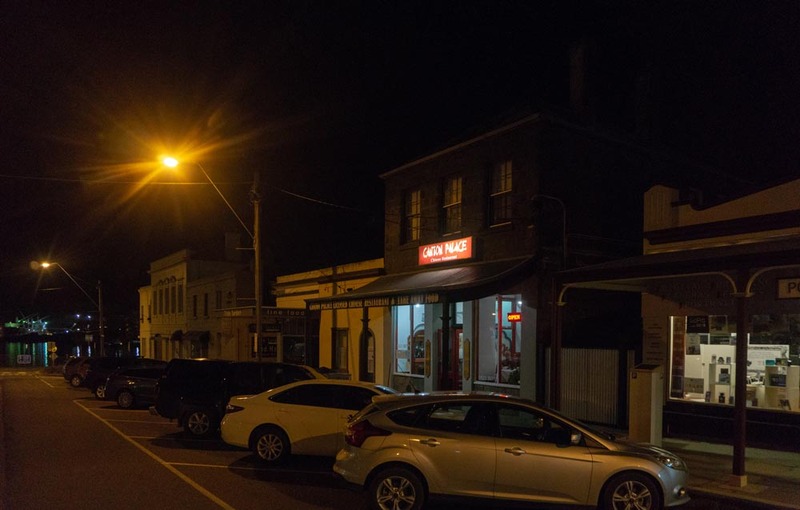 Armed with two addresses, we did a drive-by and fixed on the Canton Palace in Julia Street. Perhaps we should have been warned by the flyer in the window. 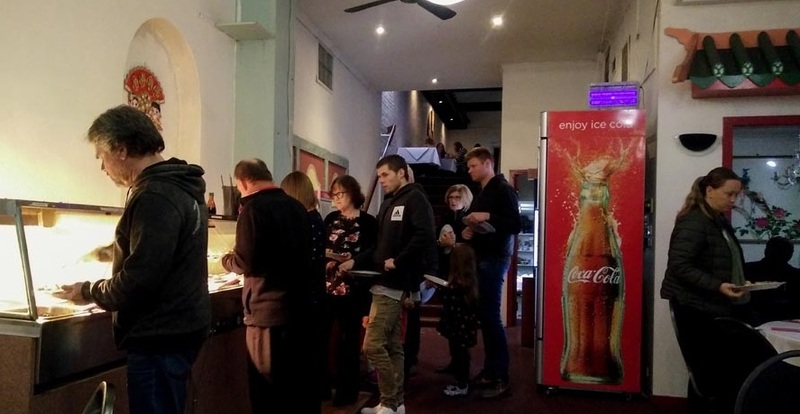 We arrived at around 6.15 on Saturday night, to find the restaurant already busy and new groups of punters crowding in behind us. Along one wall was a bain-marie, with a long queue of pensioners shuffling towards it, plates in hand. It seems the magic words “all you can eat” are a very big draw card in Portland. The pensioners having got in early to scoop up the best and freshest of the offerings, a new crowd began to arrive – mostly families. It was “pay at the door” for your meal and your first drink, typically a Coke or a Crownie. By 6.30 every table was full. With the buffet finishing at 8pm, it was important to allow maximum eating time. We decided to order off the menu, rather than line up for the “five entrees, six mains and three desserts, with as much tea and coffee as you want”. This was probably a mistake. The couple we assumed to be the proprietors were sprinting from one end of the restaurant to the other, delivering drinks (not included in the $23 charge) and seating new arrivals at their tables. 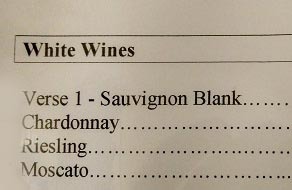 It took a while before anyone had time to take our order but the bottle of “Sauvignon Blank” arrived fairly promptly after that. We ordered two dishes: the Canton Palace combination with vegetables, and a Szechuan chicken. Other than a hint of chilli in the latter, they tasted exactly the same. 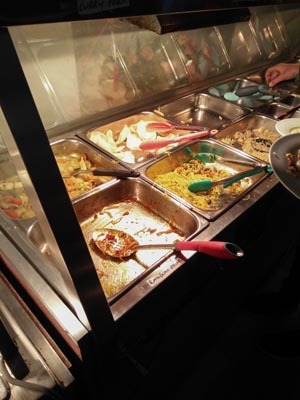 Yes, there were vegetables – traditional Chinese carrots, broccoli and cauliflower, plus a few pieces of baby sweetcorn – coated, like the meats, in an unidentifiable sauce well-thickened with cornflour. We might have been better off with the steak and black bean, lemon chicken and other Aussie/Chinese classics from the buffet. They were all out of Rainbow beef though. 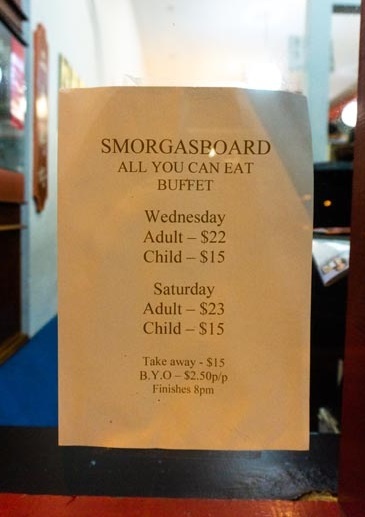 To be fair, although the food wasn’t great, the Saturday smorgasboard [sic] could be serving a very useful social function in Portland. Instead of a long table, a giant round table was shared by many, families gossiped, and children circled endlessly around the ice-cream tub. Elderly women vied with each other to see who could load the most food into an 17 x 11 x 5 cm plastic take-away container (just $15 for all you could cram in). A frazzled looking cook appeared from the kitchen at intervals to top up the trays. Presumably the whole performance is repeated on Wednesdays. So what if it’s quantity, not quality? Who cares that we were the only people in the place using chopsticks and bowls rather than plates and cutlery (and feeling a big pretentious)? Who are we city slickers to poke fun at what goes down in Portland? But, somehow, I don’t think we’ll be visiting the Canton Palace again.